JEFFERSON, Pa. (June 7, 2018) – In weather conditions that would cancel most motorsports events, Round 1 of the AMA Pro Hillclimb Series not only came off, it generated a good bit of excitement in the process. A little rain turned into a lot of rain on Sunday afternoon, but that wouldn’t stop the loyal race fans from Jefferson, PA from coming out to see what turned out to be a vertical mud bog. It almost seemed that the more it rained the louder they cheered. It wouldn’t stop the kids from having fun, as it was as good an excuse as any to play in the mud. Starting the day off was fan-favorite Molly Carbon in the 450 class. The cheer of the crowd could be heard over the rev of her motorcycle as she pushed her way toward the top of the hill, unfortunately going down just short of the checkered flag. 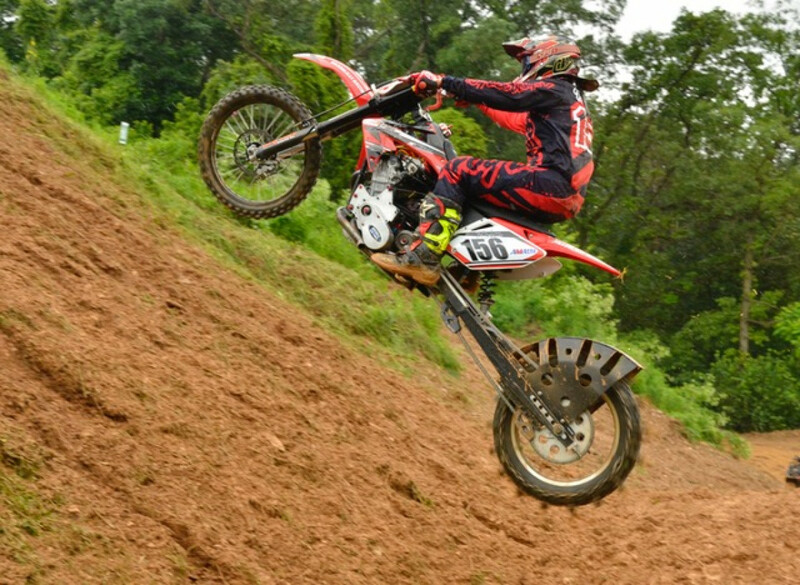 The hill would prove to be just as difficult for the next several riders, as it wasn’t until the 5th rider Bryan Rusnak reached the top in a time of 12.084. As the class of 15 riders continued, it would be returning AMA Pro 450 Champion Jay Sallstrom ending round 1 with a time of 8.729 seconds – the fastest time so far. John Koester would be the closest contender, only trailing by eight tenths of a second. Meanwhile Jockamo Baldina would have some work to do in the 2nd round with a 3rd place time of 11.2. Jay Sallstrom launches in the Jefferson, PA, mud. Conditions were ugly, but the racing was quite good. Little did Sallstrom know that his class win was already a sealed deal. As the race continued into the second round, it became evident that reaching the top of the hill would be nearly impossible. The rain had turned the hill into greasy, heavy mud that made it hard for the hillworkers to even stand. At this point, it no longer became a race to the top for the riders and the fans, but rather a challenge to see who could conquer the hill. It would be rookie rider Justin Hampton, making his first AMA Pro appearance, to the be the only rider to make it to top in the 2nd round and landing himself a top-10 finish in the class and putting the crowd on their feet. The Xtreme Class would kick off with Cody Mason setting the bar with a time of 9.58. Meanwhile, Deryk Beaudoin made an epic return on the Matt Luna (aka ‘Lunatic’) nitrous-injected 600 with a time of 9.182 to put him in the lead. That was the first time in Pro competition that Beaudoin had ridden the bike. You could sense the anxiety of Beaudoin’s team as reigning AMA Champion John Koester made his way to the bottom of the hill for his first attempt. Koester dominated 5 of 6 rounds in 2017 so all eyes were on the clock. With a twist of the throttle , Koester – flawless, fast and steady as always – raced to the top of the hill in what looked to be a contending time. But when the clocked stopped, it was Deryk Beaudoin still in the lead! Then came 2-time Unlimited Champion Vinny Nuzzolilli, who hadn’t taken a win in this class in ten starts. Vinny had made some adjustments to the Xtreme bike to match the setup and feel of his unlimited bike. Question was, would the new set-up work? As Vinny raced the nitro-injected CBR600 to the top of the hill, it was one of those runs you just knew was going to be fast. And it was… an 8.743, the new fast time of the day! As the race neared the end of the 20-rider field, Vinny’s time seemed to separate itself from the rest of the pack. Nobody but Vinny had been able to break into the 8 second mark. That is, until Wild Man Jack Mason lined up in the hole. Determined to win a championship and deserving of the DW7 Hard Charger award, Jack focused his eyes at the top of the hill. Wasting no time he popped the clutch and was gone. Before you knew it he’d crossed the finish line posting a time of 8.75. You could hear a sigh from the crowd when the time to beat was announced as an 8.74. Jack had missed the time by a hundredth of a second! With conditions continuing to worsen, the 2nd round of the Xtreme class left riders with little hope of making it over the top. It had to be motivating for the riders that so many race fans continued to weather the storm. The conditions were so bad that only two riders would better their positions in the 2nd round. Cory Strickler and Nick Mosko both had distances in the first round and topped the hill in the 2nd. The class ended with Nuzzolilli on top, Jack Mason 2nd and Deryk Beaudoin 3rd to round out the podium. The Unlimited Class would yield 11 riders, with Nuzzolilli being first on deck. As he prepared for his run he saw a line nobody else had seen. With most riders lining up in the middle or right hand side of the hill in the previous classes, Vinny would do just the opposite and line up to the far left to find fresh ground. That decision paid off with his one and done time of 7.498. With hill conditions continuing to deteriorate, John Koester would find himself within a second of Vinny’s time, with an 8.353. Phil Libhart would later make his way out on the 1973 T140 Triumph to turn in a time two tenths faster than Koester to land him in second. Joseph Lowe would be the only rider to take a second attempt in the unlimited class. Lowe did not want to settle for a distance from the first round so he was left with no choice but to try to run for time. He bettered his position considerably by turning in a time of 12.618. This left Nuzzolilli with the win, followed by Libhart and Koester on the podium. The Xtreme podium featured winner Vinny Nuzzolilli (center), runner-up Jack Mason (left) and Deryk Beaudoin (right). Round 2 of the AMA Pro Hillclimb Series hosted by Bushkill Valley Motorcycle Club is set for June 10, 2018, with action starting at noon. Be there!